The Rogowski diagnostic coils are formed from two layers of concentric windings, insulated by fibreglass, and enclosed in a stainless steel braided sheath. The European Domestic Agency has signed a contract for the manufacturing of the CER diagnostic coil system, an important milestone on the road to supplying 25 percent of the diagnostic systems required for ITER. A CER coil (for Continuous External Rogowski) is an inductive sensor designed to measure the toroidal current flowing within the contour of the toroidal field coils, which approximates to the plasma current under steady conditions—making it a key measurement with relevance for safety and plasma control. CER coils, measuring approximately 50 metres in length, will be located within the casings of three toroidal field coils. 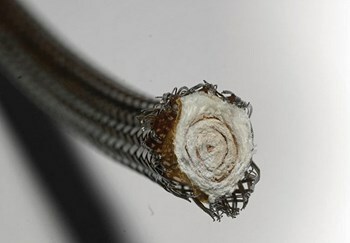 The diagnostic coils are formed from two layers of concentric windings, insulated by fibreglass, and enclosed in a stainless steel braided sheath. In contrast with other measurements of plasma current, the Rogowski method provides the measurement with a single sensor, resulting in very high reliability. This contract milestone follows design worked carried out under a grant awarded by the European Domestic Agency, successful prototype testing in 2011, and a successful Final Design Review in 2013. Two European companies have been selected: Axon (France), for the electrical aspects of the system; and Sgenia (Spain), for the mechanical aspects. A manufacturing readiness review meeting was held with the contractors in order to verify final preparations for manufacturing, which is expected to start in April. Walter Rogowski (May 7, 1881 — March 10, 1947) was a German physicist who bridged the gap between theoretical physics and applied technology in numerous areas of electronics.